Tight space in your ceiling? No problem! Have a room in which you want music overhead, but don't have much space to work with above your ceiling? Monitor Audio's CSS230 ultra-shallow in-ceiling speaker is designed for just this scenario. At less than 2" deep it fits into ceilings where space is tight, and delivers the rich, revealing sound that Monitor Audio is known for. 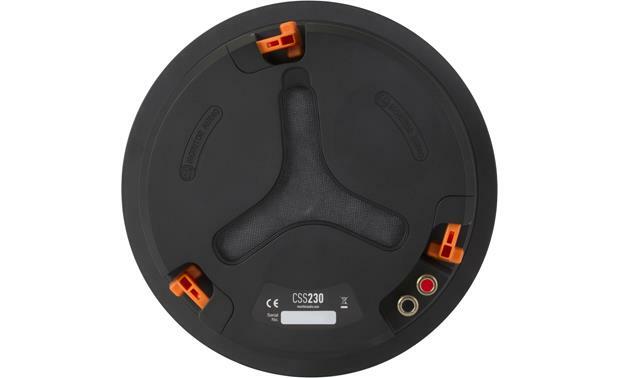 At about 2" thick, the CSS230 is able to fit into shallow ceiling cavities. The CSS230 uses Monitor's signature C-CAM® (Ceramic-Coated Aluminum/Magnesium) gold dome tweeter for clear, detailed highs and realistic reproduction of instruments, vocals, and dialogue. It's the same tweeter design found in many of Monitor's highly acclaimed bookshelf and floor-standing speakers. This speaker uses a trio of 3" C-CAM woofers for textured, accurate midrange. Because of the shallow nature of this speaker, it doesn't produce much bass when the cabinet is sealed. 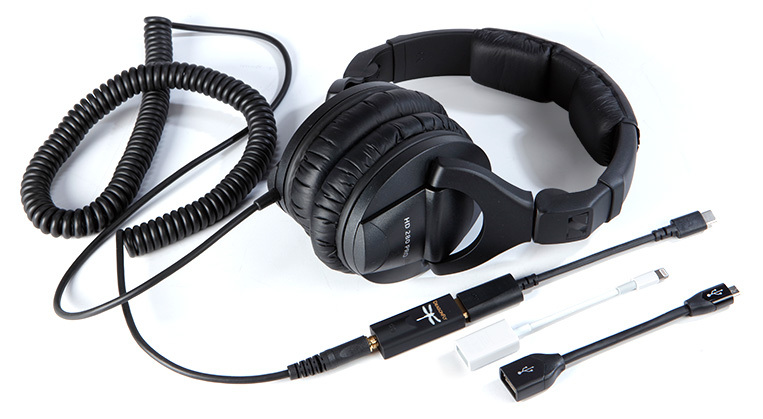 However, if you remove the included port plug, the enclosure turns into a bass reflex design, which widens the frequency response from 100 Hz down to 85 Hz — sweet! One of my favorite features of the CSS230 is the back-box that's built onto the speaker. This carefully designed enclosure helps it deliver consistently focused, well-balanced sound no matter what kind of space is above it in your ceiling. It also keeps dust and dirt out of your speaker. C-CAM Multi-Driver Array: The Monitor Audio Super Slim series CSS230 in-ceiling speaker features a multi-driver configuration consisting of three 3" C-CAM bass/midrange drivers in a radial array around a 0.75" C-CAM gold dome tweeter. A high quality crossover design offers Monitor Audio's award-winning signature sound quality. 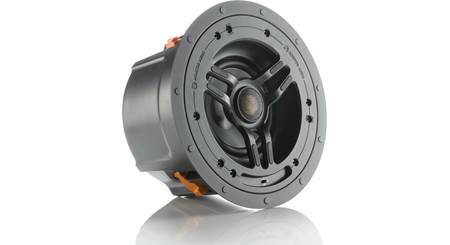 0.75" C-CAM Gold Dome Tweeter: The gold dome tweeter is formed from a ceramic-coated aluminum/magnesium alloy, gold anodized to a specific thickness for ideal stiffness and damping characteristics. Its new profile and surround geometry have been developed using advanced modeling tools, to provide the optimum qualities for accurate sound reproduction. 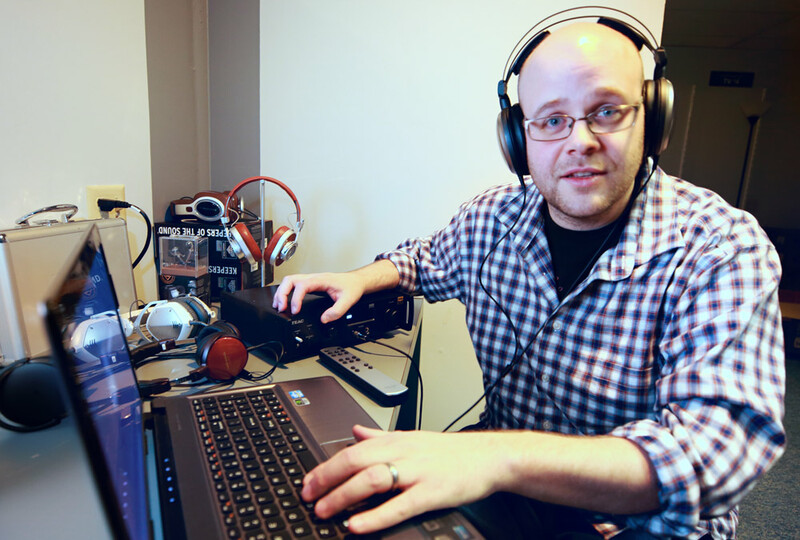 The new design moves the first order of breakup to beyond 35kHz, producing a linear response way beyond audibility, which matches the wide frequency bandwidth available from HD music and cinema sound formats. The gold dome is thinner, lighter, more rigid and therefore more efficient than domes made from other materials which are prone to distortion in the audio band. 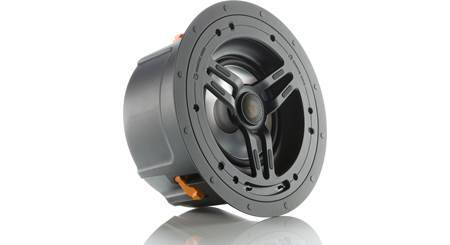 Three 3" C-CAM Cone Woofers: Ceramic-Coated Aluminum/Magnesium is a material originally developed by the aerospace industry for jet engine components. 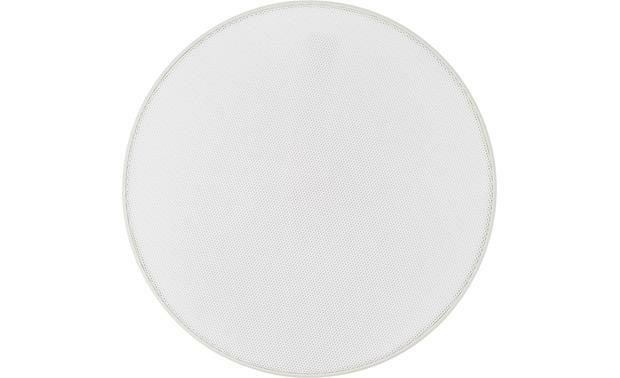 Its properties are ideal for loudspeaker cones being extremely rigid, yet light enough to yield high overall efficiency. 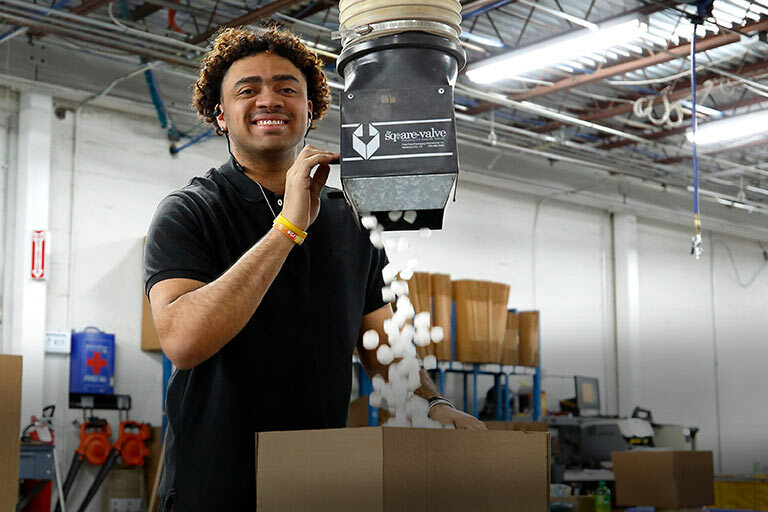 In manufacturing, aluminum/magnesium alloy undergoes a three-stage stress-relieving process to remove surface deformation and molecular weakness. Once formed, the alloy cone is subjected to a high temperature anodic coating process in which a layer of pure ceramic alumina is depleted onto its surfaces to a depth of 50 microns, producing a completely rigid sandwich of alloy and heat-dissipating ceramic material. Conventional cones are liable to flex or twist in operation, producing a significant level of audible distortion. C-CAM cones have a much higher resistance to bending stress and therefore exhibit much greater fidelity over their entire operating range. 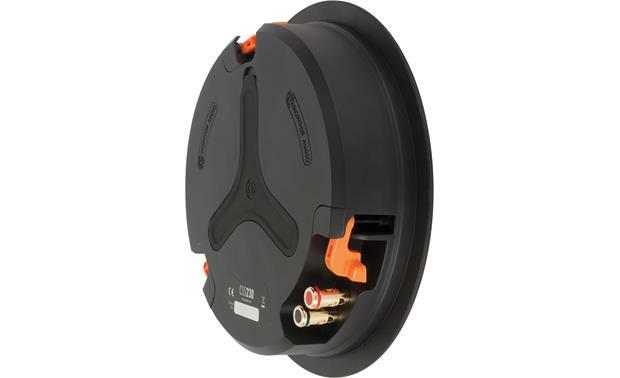 Hybrid Sealed/Open Back Design: An enclosed or open back-box option provides flexibility when mounting the speaker in your ceiling. The sealed back option offers sound isolation in wherever the CSS230 is installed, and is not reliant on the specification or acoustic properties of the wall cavity or building materials. The sealed back option also protects the precision-engineered multi-driver system against the accumulation of damaging dirt and dust. 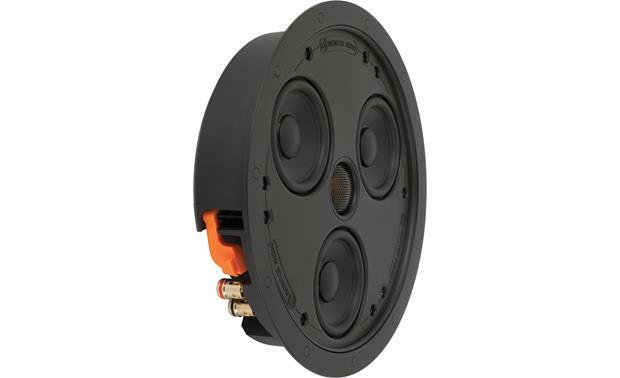 Super-Slim Mounting Design: The Monitor Audio CSS230 in-ceiling speaker features a super-slim mounting depth of only 2" that is designed to fit within 2" stud walls or where space is restricted. It requires a round 8.3125" (diameter) cutout. 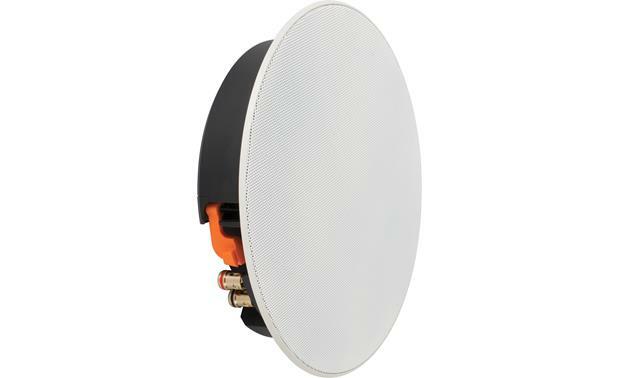 Note: The CSS230 in-ceiling speaker can only be fixed into drywall, plasterboard, or suspended ceilings with a thickness of 0.125" to 0.5625". "Trimless" Magnetic Grille: The CSS230 in-ceiling speaker features a steel-mesh grille that is held in place by high strength Neodymium magnets covering the entire speaker for a true "trimless", stealth look. The grille is paintable to blend with the living environment; additional scrim material is provided for trouble free painting. 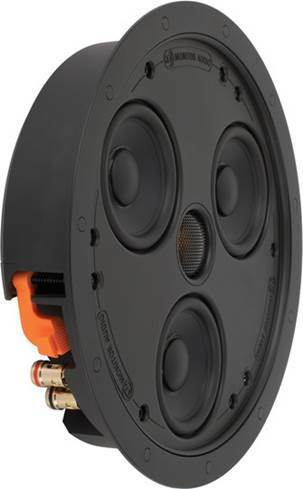 Spring-Post Terminals: The Monitor Audio CSS230 is outfitted with two gold-plated spring-post terminals to connect your speaker wire. The spring-post terminals which accept bare wire (up to 10AWG), banana plugs (sing/dual), and angled pin-connectors. 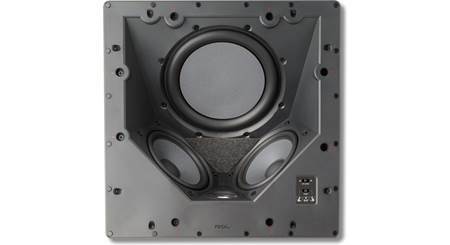 Searches related to the Monitor Audio CSS230 Ultra-shallow in-ceiling speaker with built-in back-box.